One species imperilled by the cane toad is the Northern Quoll. The northern quoll has been almost driven to extinction in many parts of northern Australia because they attack the toad and are subsequently poisoned. The poison kills the quolls too quickly for them to learn not to do it again. In a recent study Conditioned taste aversion enhances the survival of an endangered predator imperilled by a toxic invader in the Journal of Applied Ecology, Stephanie O'Donnell, Jonathan Webb and Richard Shine from the University of Sydney tested whether quolls could be taught to avoid eating cane toads through "conditioned taste aversion" (CTA). Working with the Territory Wildlife Park, the researchers took a group of quolls and taught half (the "toad-smart" group) to associate eating a cane toad with feeling sick by feeding them a small dead cane toad laced with thiabendazole. The cane toad was too small to kill the quolls with its poison, however the tiabendazole made them feel sick. The second half of the quoll group ("toad-naive") were not fed the cane toad. The next part of the experiment was to feed the quolls a small, live cane toad in plastic container to see whether or not they attacked it. It was found that the toad-smart group was less likely to attack the toad in the plastic container. See the video below to catch this behaviour in action. It was also found that the toad-smart group survived up to five times longer in the wild than "toad-naive" quolls. The researchers also found that male quolls were far more likely than female quolls to attack cane toads. Dr Webb thinks that aerially deployed 'toad baits' ahead of the cane toad invasion front could educate quolls to avoid attacking cane toads before the toads invade. Cane toads were introduced to Australia from Hawaii in June 1935 to control the native Cane Beetle. They bred immediately in captivity, and by August 1935 more than 102 young toads were released in northern Queensland. Toads now number over 200 million and have steadily expanded through Queensland, reaching the border with New South Wales in 1978 and the Northern Territory in 1984. It is estimated that cane toads migrate at an average of 40 kilometres per year. The video below (from YouTube) shows the toad-smart quoll leaving the cane toad alone - then knocking over the camera. Robyn Williams in conversation with Richard Dawkins, or is that Emma Watson? Richard Dawkins, apart from being the popular face of atheism, is a highly regarded scientist. Recently Dawkins spoke to Robyn Williams about the ideas underpinning his new book, The Greatest Show on Earth, in particular the intricacies, patterns and anomalies produced by the process of evolution. Dawkins then takes further questions from the audience about the theory of evolution, genetic determinism, the climate change denial movement and the place of religion in the world of science. This video below comes courtesy of SlowTV, a free internet TV channel delivering interviews, debates, conversations and public lectures about Australia's key political, social and cultural issues. It is produced by The Monthly and there is an impressive amount of science content. You can subscribe via podcast. 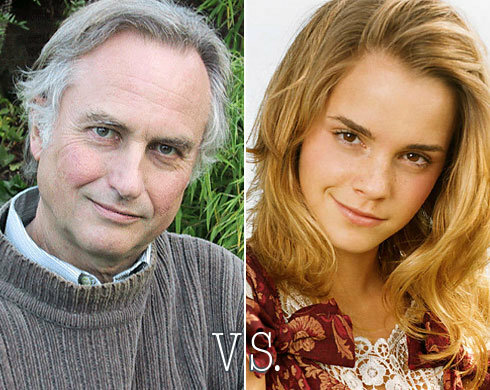 Before taking in the video however, have you ever seen Emma Watson and Richard Dawkins in the same place? The rest of the series can be seen at SlowTV. I reviewed Dawkins's book The God Delusion a few years back - I think my thoughts on the topic have probably evolved since then. Lord Martin Rees is UK Astronomer Royal and President of the Royal Society. He was also appointed to the House of Lords in 2005, is Master of Trinity College, Cambridge, and is the author of about 500 research papers and several books. I recently came across these videos of Lord Rees on SlowTV, a free internet TV channel delivering interviews, debates, conversations and public lectures about Australia's key political, social and cultural issues. It is produced by The Monthly and there is an impressive amount of science content. You can subscribe via podcast. In the inaugural Derek Denton lecture in Science and the Arts at University of Melbourne, Lord Rees discussed current ideas on cosmology and how the universe evolved from a simple Big Bang to its present complexity. He also talked about the possibility of life elsewhere in the cosmos. I had quite an enjoyable afternoon listening to this talk in the background. It is clear why he is regarded as one of the world's foremost science communicators. Astrobiology is a fascinating and complex field of science. It is the study of the origin, evolution, distribution, and future of life in the universe, and is a relatively new field of science incorporating astronomy, biology, geology, palaeontology, physics, mathematics and other disciplines. I spoke to Dr Carol Oliver, a science communication researcher working for the Australian Centre for Astrobioligy, whose key goals include contributing to the understanding of the orgin of life on Earth and to set an Australian life-seeking instrument on the surface of Mars. I spoke to Jon Lomberg, one of the world's most distinguished space-artists. Lomberg was Carl Sagan's principal artistic collaborator for more than twenty years and in 1998, the International Astronomical Union officially named Asteroid Lomberg in his honour. In 1972, Sagan asked Lomberg to illustrate The Cosmic Connection, after which they worked on NASA's interstellar Voyager Golden Record, a record included in the two 1977 Voyager spacecraft. I spoke to Bianca Nogrady from New Scientist about the NS article The biggest mysteries of our solar system.